These photos are in the reverse order, so this is the state f things at the end of the game. Two land speeders and an attack bike were just itching to unleash revenge on the stranded fire dragon squad, but the game ended on turn 5. 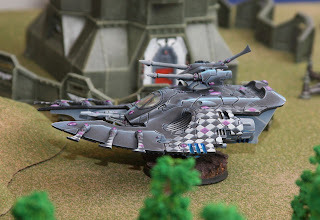 The eldar won this time. 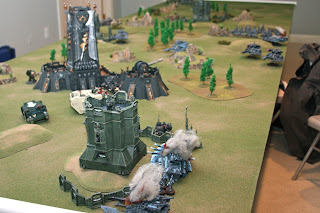 Fire dragons show ups to try and kill the loan terminator to take the kill point lead. They do so, but my land speeders take out their transport and leave them stranded. There is not much I can to do get to them though, so no kill points for me. This is by far my favorite paint job on a vehicle. It is just masterful. The DA wheel around to try and get in range. 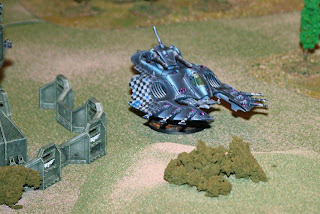 A lucky shot damaged and eldar transport. Rob moved all of his forces just out of range, leaving the lone terminator with nothing to do but run and hide. Say hello to Mr. Multi-Melta. 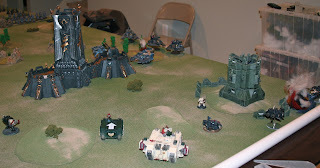 DA Turn: The tanks drive on, and the terminators enter the game using the teleport homer from the RW land speeder. The bikes died under a torrent of gun fire. So too will the terminators. Turn 1: The lone transport luring the DA to their deaths. 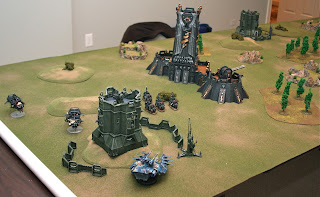 After months of scheduling, three of us met up and finally had our first battle. 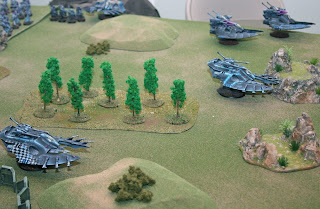 My opponent, Rob, played Rob's unbelievably beautiful Eldar army. In hind sight, I really should have setup my tripods and and lighting sources to get better photos. I wanted to play the game and found the photography interfering. I think this comes from not knowing the rules very well, so I was focussed on trying to learn the game rather than focusing on the photos. We played an 1850 annihilation game and I gave up turn one. This was my first kill points game, and it I lost by one point. My troops never even got out of their transports! 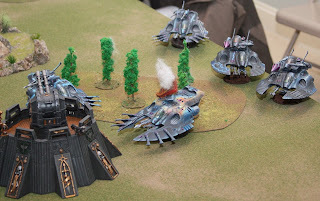 The eldar jumped on the board turn one, annihilated my bike squad, and then jumped back in their transports and flew away, taking pot shots at me for the rest of the game. I tried to make a wall of troops to slowly box them in, but I could not maneuver fast enough. 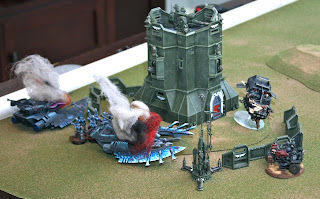 The size of the table did work to the eldar advantage, but realistically Rob is an excellent player, so he would have schooled me no matter what! I am not sure what tactics I should have used. I definitely needed more long range firepower. The photos are in reverse chronological order. This way you get to see the smoking husk of a fire prism and a troop transport first! 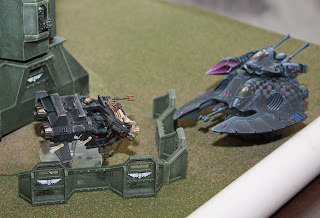 I finally added drivers to the land speeders in preparation for my first large game of 40k. I've done some painting clean up work, but am ready to see these guys on the field. 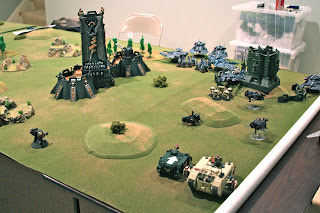 As I have mentioned before, I don't really play the game that often, but I like to use the rules to organize my painting projects. 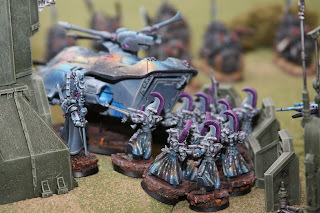 These guys are slated to part of a narrative campaign, including some unbelievably well painted eldar, a traitorous imperial planetary governor and all of the regulars that accompany the slide of an imperial world into the worship of chaos. Today was are just learning the rules, so it will be a straight forward 1850 pt game. 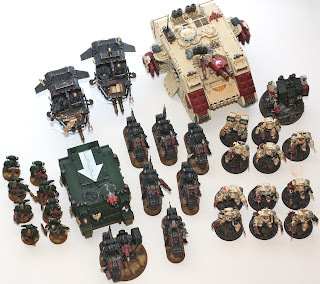 My army has all three varieties of Dark Angels. 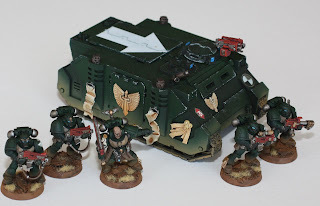 I've got some green wing vets in a rhino, two squads of terminators led by Master Belial, and a full raven wing squad let by Master Sammael on his land speeder. So now comes the question of how I play these guys. 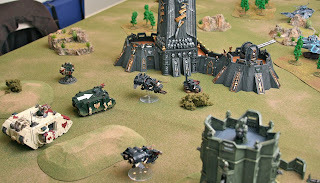 The ravenwing squad can outflank, and scout. 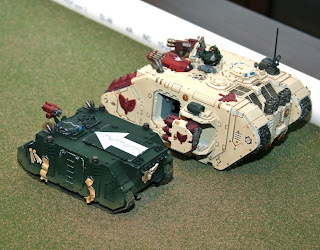 One squad of terminators can hitch a rid in the land raider, and I can keep one in reserve for deep striking. In terms of tactics, my plan so far, unless someone posts some better strategies, is to move the rhino and land raider forward as fast as possible using the rhino's smoke grenades first turn. 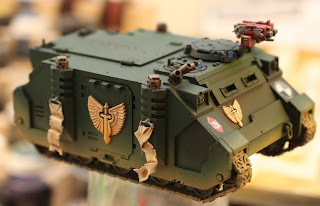 The rhino should be able to provide a cover save to the land raider which can then use its smoke the next turn to return the favor. 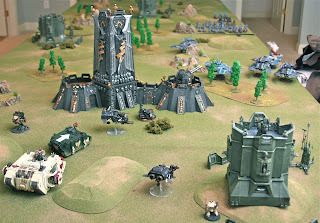 I can sandwich Sammael in between, so I can concentrate my firepower on whatever the terminators and vets are driving towards. To ensure the enemy gets where I need them to be, I plan to spit my bikes into 3 units, accompanied by the support speeder. There are two meltas, so I should be able get in melta range turn one. 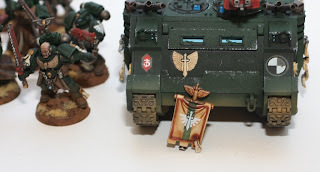 The sergeant has a power sword, so I can use him to tarpit any unit I need to slow down. I think of the bikes as my cowboys herding the cattle to slaughter. 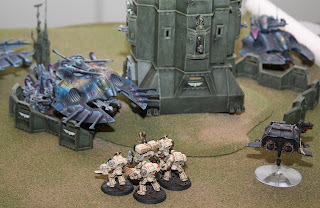 The fulcrum of the operation will be the one deep striking terminator squad. Since they will be the least maneuverable, I need to get the bikes in position to drop these guys behind my forward advancing troops. Between them and the bikes I have a hammer and an anvil. 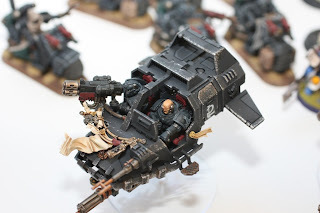 I am not bothering to bring a psyker, for no other reason than I don't really think they belong in a DA force. 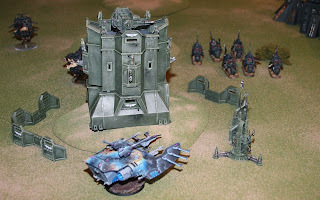 That might prove to be my undoing as Eldar are the kings of weird mental attacks. With this many moving parts I am sure things will go wildly wrong during battle! 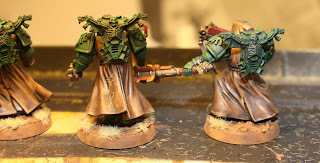 I've done some more work on my vets as you can see. I am not thrilled with the painting on these guys, but that probably has to do with me having such a hard time painting the robes. The backpacks I chose are available from GW still. I noticed that the chirugeon backpacks looked just like the heresy era DA symbol and had to have them. There is a down side though, they are metal and as you might be able to tell from the photos, they keep popping off while I am working on them, leading to all kinds of chipped paint. 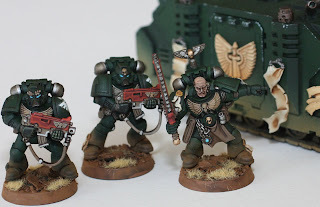 I've got 5 more of these things, and I really wish I had put them on my AoBR marines to give them some more character as well. I tried a bunch on new techniques on these guys, and the jury is still out. I started with a white primer and then washed the armor black. The goal was to then use the gradations in color to let the airbrush naturally shade the miniature. 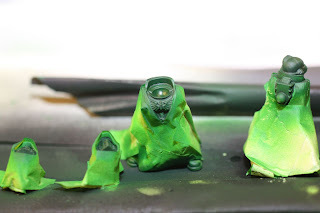 I did not want the green all over the robes, so I carefully wrapped the DA up in little tape coats before spraying. 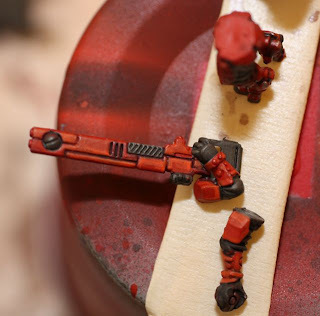 In the first WIP shot you can see the nice shading the airbrush was giving the minis. I went overboard and put too much green on rather than stop while I was ahead. 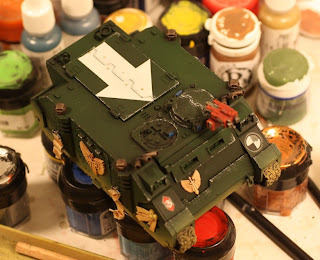 Now I have to go back and black wash the crevices, and then re-highlight with scorpion green. I have quite a ways to go with these guys, but I could not resist putting a photo up. 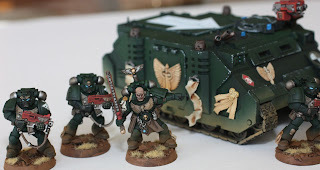 I love this pre-heresy dark angels backpacks. They came with the chaos needle harness thing for chaos apothecaries. 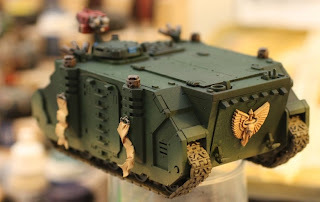 I could not wait to have a DA powered armored squad to ride in the new rhino, so rather than fiddle with all of the pieces needed to put one together I decided to grab and extra AoBR plastic set and just paint them up as DA. This allowed me a stress free way to try out some new techniques as well. I used an airbrush to base coat these guys, and have done very little highlighting, focussing instead on blending them into the background. 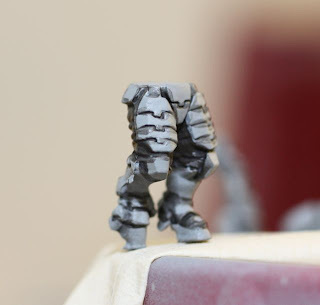 I threw together some dirt bases, and since I was working with test models, I went ahead and tried the forge world earth colored powder around each of the models legs. I did this once before basing them which was a mistake since the powder came off while trying to hold them down for the glue to dry. I am really liking the powders. I recommend that everyone goes out and gives them a try. You can always grind up pastels found at local art supply stores if you don't want to mess with international shipping. I now have a force containing GW, DW, and RW! 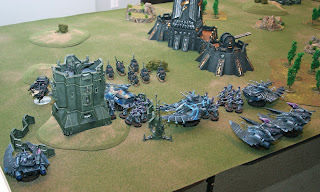 Which means if I ever get around to playing the game, I have a very colorful and characterful army. 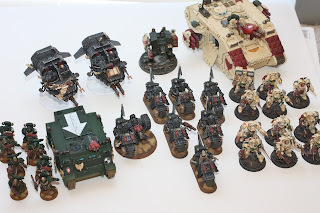 Should I go back and paint the full 10 man tac squad I have ready to go? 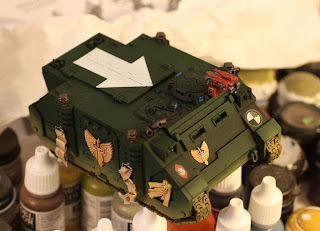 Should I paint up another rhino while I remember the recipe? 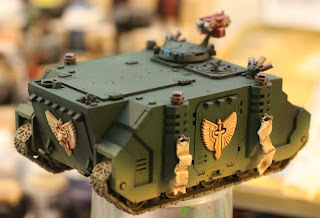 I was having a tau-ible time painting the...tau, so I thought I should go back to my roots as a Space Marine player and paint up a Rhino for my Dark Angels force. I don't have any powered armored DA painted yet, but I really like the look of the PA, the DW, and RW together. So far I am really happy with how this is turning out. My dust spray along the skirt is a little sloppy because I did not feel like cleaning my air brush even though I felt it getting gooey. My least favorite part of this model is the matte varnish. Once again, it has left a strange texture on the surface of the vehicle. I still have scratches to add to this, as well as forge world powders. 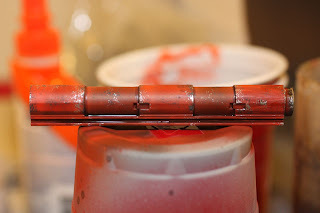 I will use the rust colored powder instead of diluted orange paint this time because I think the orange would just not cover the green properly. I haven't decided just how dirt to make this thing yet. 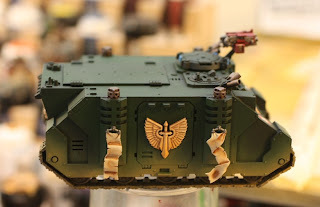 I plan to paint the top hatch with the tactical squad symbol using the airbrush and some painters tape. I haven't decided how to weather the arrow symbol yet. I could steal a little of my wife's hairspray and sprinkle some sand on it prior to air brushing. I think that would give a nice chipped affect. 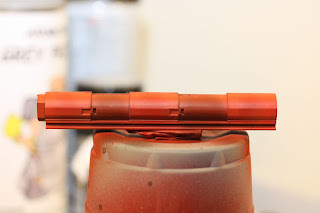 The easy path is just to use a sponge to add some DA green back over the top. Bad Devlan Mud? 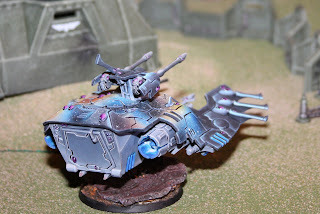 Tortured Tau? So I am back to white primer, and I am loving every minute of it. So long grey blobby primer, nice knowing you. 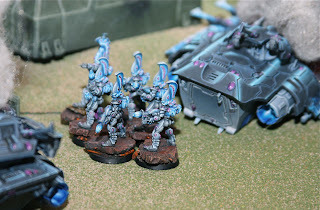 So the great part was that my paint coverage was ultra smooth, but I forgot to adjust my colors to reflect a white base. 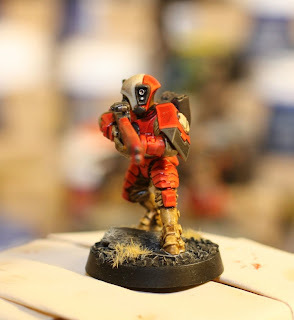 This means I have one very red/orange fire warrior. The same bottle of dev mud that might have made my pervious painting test shiny, did it again. I don't know what is going on with the stuff, but here are some WIP shots so you can see what I am talking about. I am not sure I like the color scheme, but will do some layering on the legs, and maybe paint some sept markings followed by some darker washes to see how it turns out. 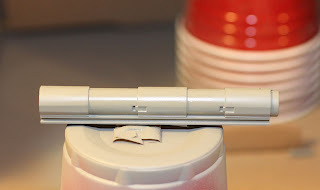 I am not sure why my primer looks lumpy, but I wonder if that affected these test paint jobs. 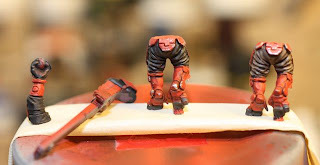 I used a grey primer and then air brushed red and then red/orange onto the armor bits. 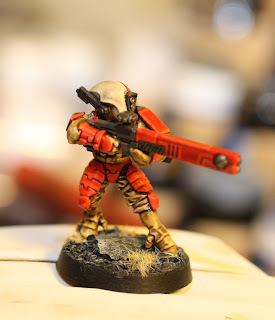 I tried the technique called under shading prior to air brushing the red to see if it would work on a miniature. At the end phase I tried sponging battle damage on one mini and using a brush with the other. I am not sure how I feel about these. 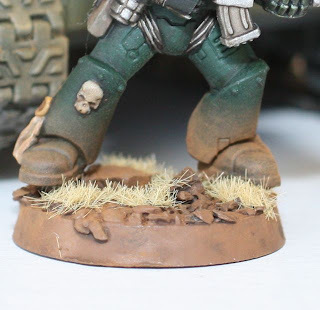 Part of me likes the damages look, but part of me thinks they would look really sloppy on the table top. I put a matte coat on them after the dev mud wash, but I can't get the gloss to go away. That is a first. This is not my first post of the day, but I needed something to work! 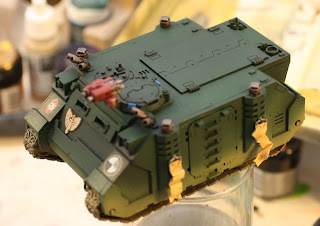 I tried the grey primer again, on a tank turret. This time I used an air brush to apply black to the recesses, followed by an overall airbrushing of pure blood red. I followed it up with a blood red/blazing orange mix. The damage inducing sponge hit it next and behold, the big blood red barrel of doom was born. 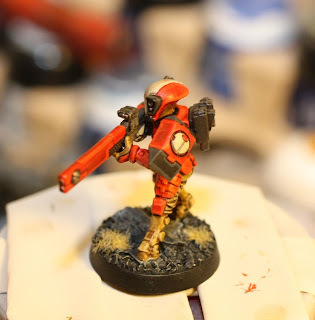 So what do you think about using this paint scheme for my new Tau. 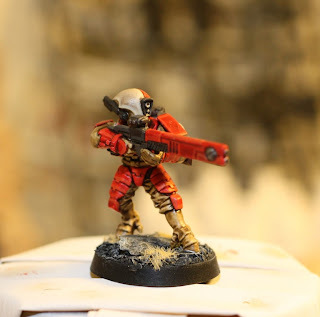 Imagine some dark grey, and bright orange Tau writing on the barrel.